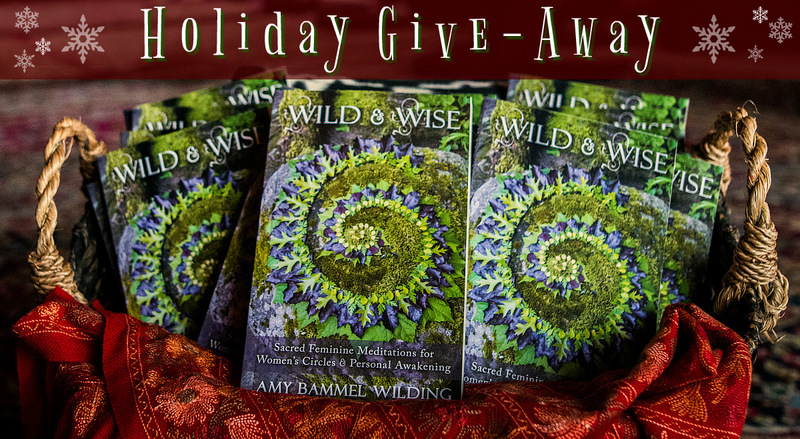 To celebrate the first anniversary of Wild & Wise: Sacred Feminine Meditations for Women’s Circles & Personal Awakening by Amy Bammel Wilding, we have a special offer for you. Buy a copy of the book and receive free audio downloads of THREE of the meditations from the book: “The Power of No”, “Cerridwen” and “Winter Spiral”. AND one lucky US and UK customer will receive a download of the entire audio book in time for Christmas. 1) Purchase a signed copy direct from the Womancraft webshop or a paperback or Kindle copy from Amazon before Winter Solstice Eve, Thursday 20th December, midnight GMT. “No” is not a word we women are invited to own and use with authority. So conditioned are we to be pleasing and accommodating that we often forget that “no” is an option. Consequently, our most precious resources — our attention, our time, and our energy — are depleted as certainly as sands falling through an hourglass. Our well-being suffers as a result, and though we can often readily identify our feelings of being physically and emotionally exhausted, it can be difficult to make the initial connection between our ability to exercise our sovereignty and our overall spiritual health. When we tap into the wild and wise power of no, we give ourselves permission to selectively channel our Sacred Feminine resources, and to cultivate well-being and healing. Cerridwen, the Welsh goddess of death and rebirth, challenges our modern western perspective that life and time are linear — with a specific starting point and a definite end — and instead invites us to embrace the cyclical example of nature. Death ensures new life; endings beget beginnings. When we embody the wild wisdom of Cerridwen, we welcome alignment with the timeless rhythms of nature, and open to the perspective that each ending ushers in the potency of a new beginning. The custom of setting new year’s intentions on January 1st is no doubt the Gregorian appropriation of traditional winter solstice ceremonies. The longest night is indeed a potent time to pause and reflect on the year that has passed, releasing what no longer serves us in order to make space for our seeds of intention for the upcoming year. When we align with the Wheel of the Year and flow with the wild wisdom of the solstice, we invite ourselves to dwell thoughtfully in the close comfort of the womb-like darkness, and make preparations for the rebirth of the sun. "The decolonization of the imagination is the most dangerous and subversive form there is: for it is where all other forms of decolonization are born. Once the imagination is unshackled, liberation is limitless."